Added two sizes of the variations product to the cart. Now: on cart page displays two products, with different sizes. Need: display one product with dimensions. How can I do it? 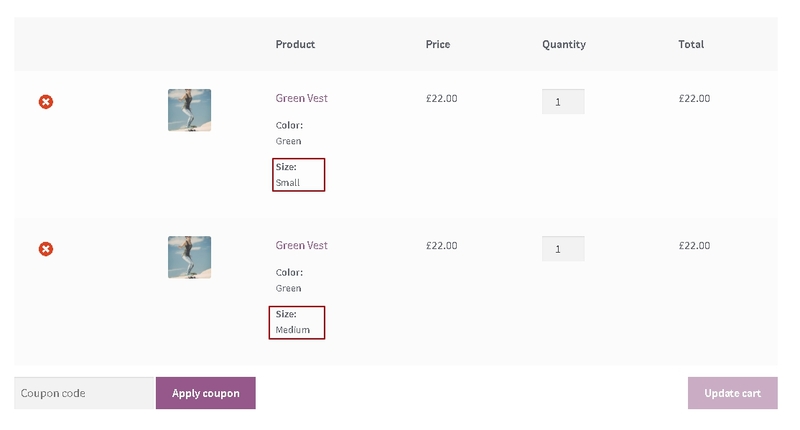 In Woocommerce variations are essentially different products, each has a different SKU and inventory count; among other properties. This separation is required for Woocommerce to function properly; shipping cost, inventory control for example. It may be possible for you to write a custom cart page and consolidate variations into a single line and display the variation (i.e. size) as you ask, but you will introduce other problems and possible confusion for your customers. For example, in your case can you absolutely guarantee that all variations of your products will always have the same price? It might be best, in the long run, to push back on this requirement and explain the risks to your customer. How we can edit variations on cart page?